It was my Christmas gift to my dad and we had planned the deep sea fishing trip for weeks. We got up in the still darkness of that January morning. The warm gulf air seemed to only make our anticipation grow as we drove toward the port. When we checked in we inquired about the seas having heard horror stories from other more seasoned fishermen. “Three to five foot swells” the man in the office proudly announced and we paid the all-day fee and boarded the boat. After a few preliminaries we were on our way out to sea along with about fifty others. I thought the bouncing of the boat seemed much more than what we were told as we made our way through the channel leading to deeper seas. The captain came over the microphone and confirmed my suspicions stating that he had just heard from an incoming vessel that we should expect fifteen foot seas. Needless to say the better part of that morning was not spent fishing. 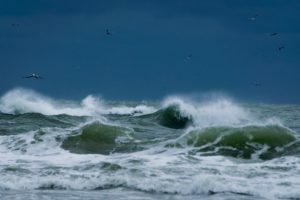 I was amazed at how small I felt out to sea in such rough waters. Our boat bobbed up and down like a cork and when the boat went up with a swell you felt as though we would tip over and when the boat went back down it appeared we were surrounded by a wall of water. I remembered the time when Jesus’ disciples woke him up when they were out in a boat in a storm and he simply looked out over the water and said, “Peace, be still.” And the waves and the wind died down. The one who gives peace is the creator of the world. I’m thankful that Jesus is our source of peace in this world no matter what our storms are.